There's been a lot of talk on the internet of late about how October 21st, 2015 is the date that Doc and Marty went Back to the Future. I wonder what they would think of actual 2015? Anyway, the reason I'm talking about the future is Lane Crawford. As part of their 165th anniversary celebrations, Lane Crawford are looking to the future. What will the next 165 years be like? 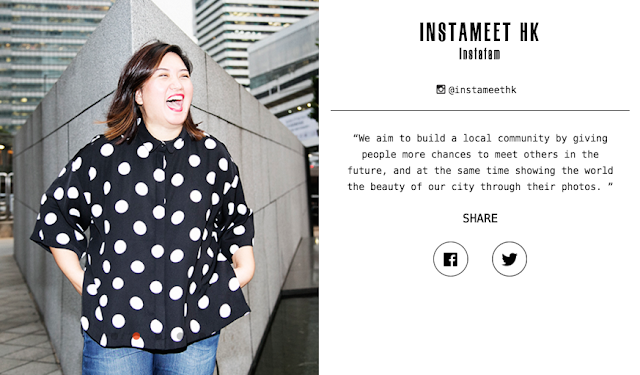 They don't have the answers, but they have put together a list of creatives and brands that they think are changing the perspective of the future and they've featured us - the InstameetHK team! You can read what they wrote about Instameet HK here, as well as see a whole heap of inspiring creative talent here at #futureperspectives. I am super honoured to have been included in this even if my picture does make me look like I'm about to eat the photographer. Don't worry, no photographers were eaten or harmed during this photoshoot.